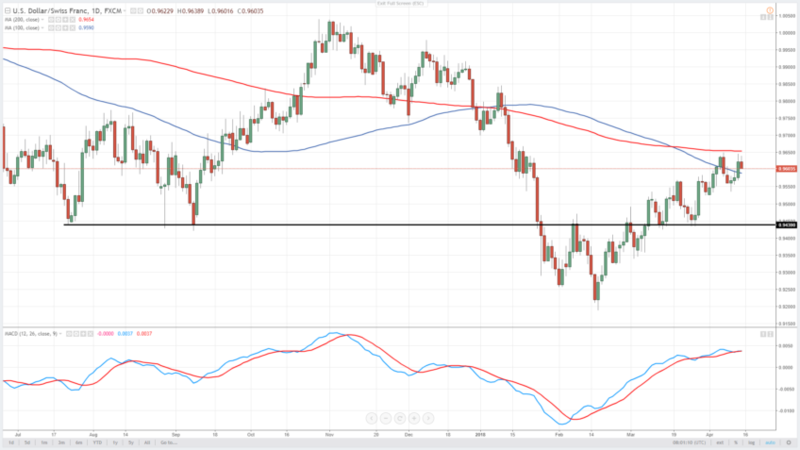 The USDCHF pair was trading slightly higher on Friday and was seen hovering around 0.9630 during the London session, approaching the 200 day moving average. There are no important macro data on the agenda today and therefore sentiment could drive the markets throughout the day. Investors are closely watching the ongoing conflict in Syria, which could very well result in a war. In addition, Chinese-USA trade relations haven’t improved a bit and the threat of a trade war is still real. However, sentiment appears positive despite these facts and stocks are bid, with the yen also weakening. In addition, gold posted a large 1.5% decline on Thursday, which is very unusual in tense times. Therefore, the USDCHF pair could continue its march higher. The resistance for today’s trading stands at the 200 day moving average, which is seen around 0.9650. If this barrier is conquered, the bearish trend could be cancelled and bulls might push the USDCHF pair toward the 0.97 level in the initial wave. On the other hand, the first support is seen around 0.9580, where the 100 day moving average is located. If not held, bears could be stronger and might be targeting the 0.95 mark. In all cases we strongly recommend to have rigorous money and risk management.